← Are you sacrificing image quality with a zoom lens? The Yongnuo 560 flash. Top brands like Nikon and Canon are expensive. Other brands often do the job you need for a lot less. On-camera, or pop-up flash often makes people look flushed from the strong light. Faces may look flat too. The pop-up flash is often the fault. Flash straight on to the face creates no shadows to define its shape. You may get ‘red-eye‘ – flash light reflected back off the eyes of your subject. These problems can be overcome by using off-camera flash. Off-camera flash refers to flash units that are not built-in to the camera. They are mounted on the hotshoe on top of the camera. Alternatively it can go to the side creating slight shadows to define the features, shaping the face. If you diffuse flash light you get soft light creating shadows without harsh edges. This gives the face a rounded, natural look. Flash from the side also means the light is not directly into the eyes, eliminating red-eye. Using off-camera flash is simple. Take a picture using your flash. Check it on the screen. If you have the right light and no nasty highlights, keep it. Otherwise adjust the flash intensity or move it. With experience you will find out what works. Simple. Shoot with flash, check, adjust. No fancy technology. The most flexible flash units are Speedlights. Use them camera-mounted on the hot-shoe, off-camera or off-set to the side with a flash bracket . The more you off-set the flash from the axis of the lens the better it is to create slight shadows on the face giving definition to the features. 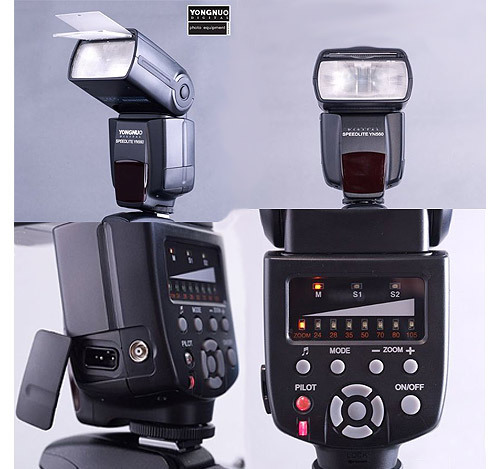 Off-camera flash units share common features. They all flash. They must connect to the camera – mounted, wired, light activated, or radio – to fire the flash. Most flash units can adjust the output power of the light. Usually they have a hot-shoe fitting. All have a mounting for use on a tabletop or light stand. Beyond these basics there may be other features available. Top brand speedlights will have about 30 main features plus custom ones. Don’t buy expensive branded flash units when starting. Less expensive flash units have slightly less light intensity and fewer features than top brands, but can be as much as 75% cheaper. Usually you still get power output adjustment. If your off-camera unit is not bright enough – move it closer! You can angle the flash to point where you want the light to go. You can diffuse the light and colour it by adding a diffuser or a colour gel. You may get a range of other add-on functions. In short, the cheaper un-branded flash units have everything you need for most purposes. For a lot more money you can get lots of functions. In truth, most people never use these extras, including professionals. All you have to do is to check the histogram on the camera to see if the shot is well exposed. If it needs changing then adjust the output of your flash. Mounting off-camera flash on the camera hotshoe connects it direct to the camera system. It is a slight improvement on the on-board or pop-up flash. However, moving further from the camera reduces the problems even more and gives you more flexibility. So you need a method to connect to your off-camera flash. The richest among us will buy a brand-specific off-camera flash. The Nikon ‘Speedlight’ range, or the Canon ‘Speedlite’ (EOS flash system) range act as a master to trigger other slave speedlights off-camera. To do this you need one flash on the camera hotshoe and another elsewhere. If this is too much, consider other options below. Nikon Speedlights… Nikon Speedlights . Flash sync cables are a simple method to connect to the camera. Use a short connecting cable for a flash bracket, a five meter cable is flexible for other use. Flash radio triggers are available for off-camera flash. Radio increases the distance you can work with flash, gives more control and reduces trip hazards. Radio can control more than one flash too. They may have a variety of features depending on the model and price. What flash should you buy? Despite the long list of features associated with expensive branded units cheaper flash units are great pieces of equipment. They have the essential features needed for a shoot – a flash of light, off-camera position and control over the output. They may even have more features than that. You really only want a flash to flash! A budget version can provide every thing you need. Once you have some experience you can buy something which will offer the bells and whistles to extend your skills (if needed). For fancy functions be prepared to pay a lot more! Try the YN460 – Electronic flash for Canon, Nikon, Olympus, Pentax, and Fuji DSLR cameras . YN560 Electronic flash Canon, Nikon, Oympus, Pentax, Fuji DSLR Cameras . This entry was posted in Background Info., Equipment, Light and Lighting and tagged Accessories, Buying equipment, Camera, Creativity, Flash, Light, Vocabulary. Bookmark the permalink.